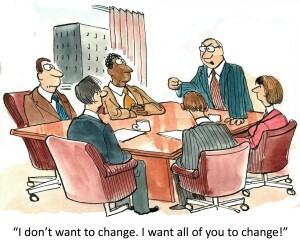 Home > Organizational Development > Why Is Management a Dirty Word? Management isn’t always seen positively, sometimes connoting images of bossiness, micro management, oppression, or worse. Per Wikipedia, management “coordinates the efforts of people to accomplish goals and objectives using…resources efficiently and effectively.” Seems reasonable. So why does management have such a bad rap? Take two quick tests: First – For your company, define Leadership and Management… Second – Would you rather be “doing”, “managing” or “leading?” Its a safe bet that you ranked managing last among these. If you are an entrepreneur and or company owner, management is always last! Doing is making things happen, sometimes as a technician or specialist. Leading is setting a course along with attracting and energizing followers. Managing is ensuring that the doing is done right on a continuous basis with the appropriate accountabilities. For many in business, managing isn’t as fun or satisfying as leading or doing. Accordingly, it can be under-emphasized among senior leaders and is considered “uninteresting work” that is relegated to others. Do you routinely miss strategic objectives? Are your key initiatives usually late or over budget? Do you have to jump into emergencies too often? Are there “too many” meetings, many starting late or going too long while lacking clear outcomes and actions? Does it feel like your company has functional “silos” and a general lack of cross-functional collaboration? Do employees have clear objectives and accountabilities? If your often think about the state of management in your company or wonder if your methods are sub-standard, you’re not alone. A great place to gauge the health of your management methods is to review Group50 Business Management Consulting Firm, Company Physical®, a series of assessments that provides insight into your Organizational and Operational health. The output of these assessments provide recommendations to vastly improve the management in your company which will improve your business results. Steve Sharp is a senior consultant with Group50® Consulting and heads Group50’s Market Effectiveness practice and Bruce Dougan is the OD Practice Lead for Group50®. The Group50 team are all former executives with market-leading manufacturing and distribution companies, professional managers who know how to install and sustain best management practices. Group50 has designed a series of strategic assessments, workshops and Strategic Execution tools that enhance business performance.